There are 98 known species of Manihot which are native to the neotropics, between Arizona and Argentina according to Rogers and Appan (1973). Manihot (often referred to as Cassava) are in the Euphorbiaceae family, also known as the spurge family, which contains 300 genera, and around 7,500 species. 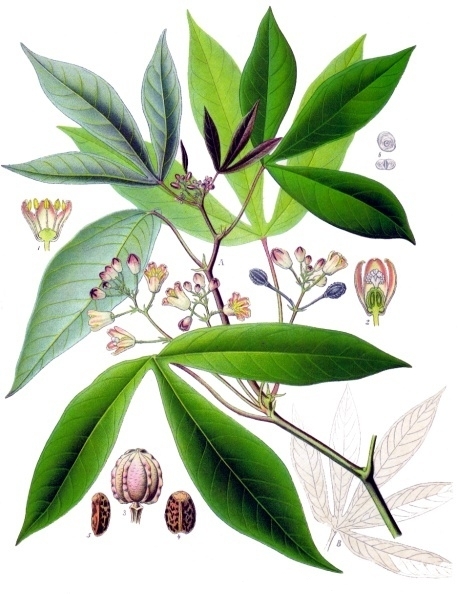 As well as Manihot, the family includes other important crop species such as Hevea brasiliensis, the rubber tree, and Ricinus communis, the castor oil plant. The genus is made up of monoecious trees, shrubs, and herbs. Central Brazil has the highest diversity, of about 40 Manihot species. Most Manihot species grow in seasonally dry conditions, are sporadically distributed, and never become the dominant species (Rogers and Appan, 1973). Manihot glaziovii growing the greenhouse. Possible symptoms of cold damage can be seen in the loss of lower leaves. Currently growing in the greenhouse is Manihot glaziovii, commonly called ‘maniçoba’. M. glaziovii is a glabrous (smooth, hairless) shrub/tree that grows up to 10m. The specimen in the greenhouse is only 1m, and so has a long way to go. The bark is smooth and pale grey, but can also be papery in texture. The leaf blades range from 10-28cm across, and are deeply palmatipartite (leaves that have lobes with incisions that extend over half-way toward the petiole). The leaves have nine lobes and peltate attachment to the petiole (the petiole attaches to the lower surface instead of the margin). A leaf of Manihot glaziovii. It has been used to make Ceará rubber, named after the Brazilian state of Ceará from where it was grown and shipped. The earliest records of export are from 1845, with the height of export occurring in the early 1900’s. Ceara rubber has high endurance while in raw form, and so was easily stored. It was introduced into East Africa, as well as Hawaii and parts of the Far East. M. glaziovii was widely distributed by Kew from 1877 onwards, from Cross’s collection in Brazil, 1876, for trial as a plantation crop for rubber production. Quite extensive plantings were made in East Africa and by 1912 there were 1,500 acres in Uganda and 100,000 acres in German East Africa (What is now Burundi, Rwanda, and Tanzania). Due to the plant’s relatively small size compared to Hevea brasiliensis (Commonly known as the rubber tree, and another member of Euphorbiaceae), and its horny outer bark, which made it difficult to tap, H. brasiliensis, became the rubber tree of choice. While it’s use has diminished for rubber, it is sometimes used in West Africa for providing shade to cocoa plants (Purseglove, 1968). 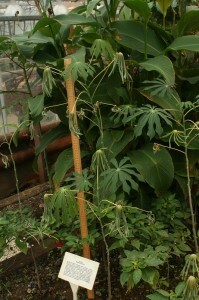 Another species of Manihot recently planted in the greenhouse is M. esculenta. The Cultigen (A plant artificially selected by humans) Manihot esculenta Crantz is cultivated throughout the tropics of the world between 30° N and 30° S of the equator, in areas where the mean annual temperature is above 18°C (Nassar and Ortiz, 2007). M. esculenta is thought to have been domesticated in the Amazon by Brazilian indians (Nassar, 1978). The cultigens of cassava have shown reduced ability to set seed compared to wild Manihot species (Jennings, 1962) meaning cassava has been propagated vegetatively for a long time. What’s more, many cultigens have been selected for their root production, over seed production. It is thought that M. esculenta was taken to São Tomé Island, in the Gulf of Guinea, by the Portuguese during the last half of the 16th century, and by the 1800’s it had made it all the way to Calcutta (Purseglove, 1968). Roots of the cassava are tuberous and firm, similar to a potato, but are long and taper to a point They can be up to 50cm long. These root tubers are highly rich in starch, and contain high amounts of calcium. The stems are erect and radiate out from the tuber. M. esculenta is smaller than M. glaziovii, growing up to 5m tall. They are similar in appearance, but unlike M. glaziovii, M. esculenta does not have distinctly peltate leaves. Another distinction is that M. esculenta‘s leaves are oblanceolate (attachment to the stem is pointed, with the other end rounded). 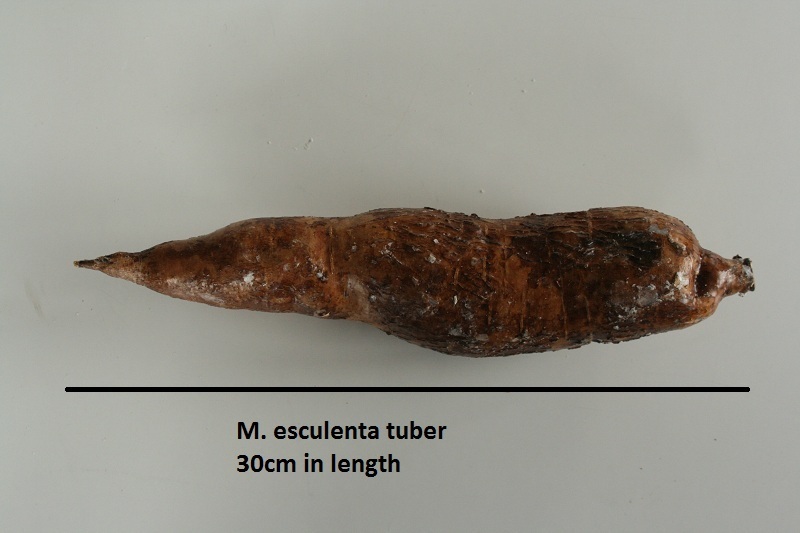 A tuber of Manihot esculenta. This one was bought from a local supermarket. They are coated in wax to prolong freshness. This one was cleaned and planted in the tropical greenhouse. M. esculenta grows best at rainfall of 100-150cm per year, but can be grown profitably in areas with rainfall as low as 50cm per year (Onwueme, 1978). Optimum temperature is in the range of 25°C-29°C, with growth stopping if the temperature goes below 10°C. Cassava does best in soil that is light, loamy and medium fertility, with good drainage. In conditions of very high fertility, cassava produces excessive vegetation, at the expense of tuber formation (Onwueme, 1978). The tuber formation is controlled by the photo period. Under short day conditions, tubers will readily occur, but when day length is greater than 10-12 hours, tubering is delayed, and subsequent yields are lower (Bolhuis, 1966; Mogilner et al., 1967). 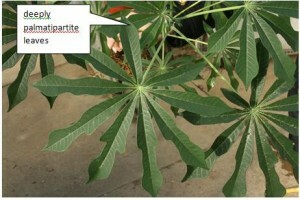 This makes cassava well suited to tropical environments. Manihot esculenta is an important food source for millions Cassava is the third most important source of calories in the tropics, after rice and maize. It is grown for its potato like tuber Due to the broad agro-ecological adaptability of cassava, and it’s ability to produce reasonable yields where most crops cannot, it has become a crucial, basic food source at the household level. Cassava has several drawbacks, which has arguably limited it’s usefulness above that of a subsistence crop. Cassava roots will rot within a few days of harvest and have a moisture content of 70%, so transportation and long-term storage in bulk is expensive and inefficient. The second problem is the roots and leaves contain cyanide. The traditional processes used in Africa, to make cassava palatable and safe to eat are thought to have originated from Latin America. Cassava can be processed in a number of ways, which reduce the amounts of toxic cyanogenic glucosides (which when hydrolised release hydrocyanic acid (HCN)) in various amounts. A popular method is one used to make Garri (also known as gari, garry, tapioca). The cassava tubers are peeled, washed, grated and then fermented anaerobically in sacks and pressed with stones for several days. It is then sieved and roasted, creating a flour like product which can be stored for much longer periods. M. esculenta can be split into two varieties: bitter and sweet. The sweet variety has a lower HCN content, which is confined to the phelloderm (bark) of the tuber. The bitter variety has a higher HCN content, which is distributed throughout the tuber. From it’s humble beginnings in the northern parts of South America, Manihot esculenta is now grown through the tropics of the world. One of the biggest threats to cassava is the Cassava Mosiac Disease. It is a viral disease that is prevalent in the cassava producing areas of Africa, India, and Indonesia, but rare in South America (Onwueme, 1978). A cassava leaf showing symptoms of cassava mosaic virus symptoms include a yellow or white chlorosis of the young leaves, leaf distortion, and reduction in leaf size. Overall growth is stunted, with yield reductions of 14-83% reported. There is also a reduction in tuber quality, and malformation (Narasimham & Arjunan, 1973). Due to the long history and widespread cultivation of cassava throughout the tropical world, it has many common names, a few of which I will cover here. Yuca (Not to be confused with Yucca) is used widely in Central and Southern America, and is thought to come from Taino, the native, pre-Columbian language of Haiti. Manioc is a Brazilian Portuguese word for the root of the cassava plant, thought to date back to the 1500’s. Tapioca is another Brazilian word, which comes from the word ‘tipi’ , which means residue, which refers to the cassava tuber after pressing for the production of cassava flour. Cassava also has a number of names in Africa. In the Zulu language it is called Unjumbula, and in the Tsonga language it is called Muthupula. At first it would seem unfeasible to grow your Manihot at home, with their very large size and tropical temperature requirements. But it appears that some people, who live in cooler climates, have been successful in finding ways round this. According to Author’s comments on the informational website ‘Dave’s Garden’, Manihot esculenta can be grown outside in frost prone areas successfully. Another comment states that the species can have the stem cutttings taken when the temperature drops, and these can be stored until spring. The stem is cut up into 6″ pieces, which sprout. They claim it can grow 12 feet (3.6m) in a season. Certainly a useful strategy. Bolhuis, G. G., (1966). Influence of length of the illumination period on root formation in cassava. Netherlands Journal of Agricultural Science. 14: 151-162. Hillocks, R. J., Thresh, A., & Belloti, A., (2002). Cassava: Biology, Production and Utilization. New York, USA: CABI Publishing. Jennings, D.L. (1962). Variation in pollen and ovule fertility in varieties of cassava and the effect of interspecific crossing on fertility. Euphytica 12: 69-76. Mogilner, I., Orioli, G. A., & Blettler, C. M., (1967). Trial to study topophysis and photoperiodism in cassava. Bonplandia. 2: 265-272. Narasimham, V., & Arjunan, G., (1973). Effect of mosaic disease on cassava. 3rd International Symposium of Tropical Root Crops, Ibadan, Nigeria. Nassar, N. M. A., (1978) Conservation of the genetic resources of cassava (Manihot esculenta): determination of wild species localities with emphasis on probable origin. Econ. Bot. 32: 311-320. Nassar, N.M.A, & Ortiz, R., (2007). Cassava improvement: challenges and impacts. The Journal of Agricultural Science 145: 163-171. Onwueme, I. C., (1978). The Tropical Tuber Crops. Chichester, UK: John Wiley & Sons Ltd. Purseglove, J. W., (1968). Tropical Crops: Dicotyledons 1. London: Longmans, Green. Rogers, D.J. and Appan, S.G., 1973. Flora neotropica Monograph No. 13. Manihot manihotoides (Euphorbiaceae). New York: Hafner Press. http://davesgarden.com/guides/pf/go/1827/#b. [Accessed 13 December 2012]. This entry was posted in Crops, Neotropics, Species, Students and tagged cassava, manihot esculenta, manihot glaziovii. Bookmark the permalink.